Requirement qualification should have Graduation degree and 02 years working experience in Banking sector. Interested applicants will be written applicaion with complete cv in self-hand. Candidates must be sent application fee taka 100/- or 50/- as treasury chalan. Applicants must be send their application along with 03 copy passport size photographs, all educational certificate and others documents. 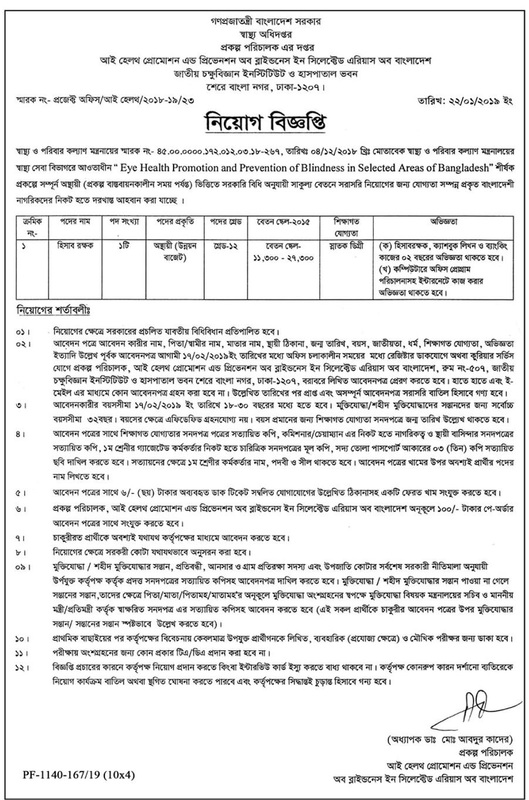 Candidates must be sent to the Project Director, Eye Health Promotion and Prevention of Blindness in Selected Areas of Bangladesh Project, Room no-507, National Eye Institute and Hospital Building, Sher-e-Bangla Nagar, Dhaka-1207 before 17 February 2019. Details circular is given below as pdf file.